An on board oxygen bottle has never exploded on a passenger jet in mid-air, until last Friday. That’s when Quantas flight QF30 from Hong Kong to Sidney, diverted to Manila after an explosive decompression at 29,000 feet. The 747-400 landed safely with 365 passengers and crew. Fragments of tank and valve parts found point to an explosion of the aircraft oxygen tank. Passengers reported that the oxygen masks deployed during the controlled descent but were not working. The Australian Transport Safety Bureau and the U.S. National Transportation Safety Board continue their investigations. Terrorism has been ruled out as a cause. Qantas Chief Executive Geoff Dixon said Monday that the company did not know what caused the mid-flight blast but suggested the cause was likely mechanical and not human error. An air-worthiness directive, issued in April and effective in May, followed a report that certain oxygen cylinder supports in Boeing 747-400s may not have been properly heat-treated, which the FAA said could cause oxygen leakage and subsequent fire hazards. David Cox, Qantas’ head of engineering, told reporters on Monday that the FAA directive applies to a different type of oxygen system than the one being scrutinized in the Qantas emergency. The cylinders covered under the directive are located in a different part of the plane than where the Qantas aircraft sustained damage. Sydney-based Qantas Airways has been ordered to urgently inspect every oxygen bottle aboard its fleet of 30 Boeing 747s, which is expected to take several days. Quantas Airlines has never lost a jet airliner. It’s last crash was in 1951 and involved a small aircraft. Interesting…I’ve never worked on a 747. However I don’t think this was an O2 tank since the only O2 tanks on most airliners are the walk-around bottles for the FAs, and the large tank underneath the flight deck which supplies the flight crew’s quick-don masks. 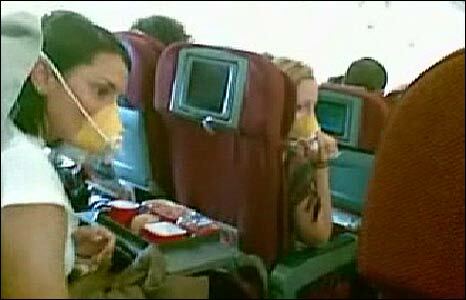 The passengers get their O2 from small solid fuel O2 generators located over the seats. I think this must’ve been one of the halon fire bottles for the cargo fire-suppression system. Those bottles are usually located just aft of the main cargo door. Which of course is where this event seems to have occurred. Well said. Makes you wonder, huh?